Democratic Underground - What was going on in Portland? You think you know all that happened in Portland because the FBI presented many photos and details of Atta’s and Al Omari’s movements on September 10 and 11 in this town? Well, be surprised there are innumerous unanswered questions. Sorry, if this is really long and detailed but some people like to know details. Otherwise simply followe the bold stuff or the comments in italics in order to see if you can find something interesting here! Then let’s see if this goal was achieved! This might be Marwan Alshehhi. 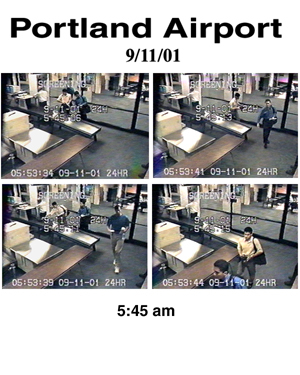 ”Kathy Barry, a reference librarian, also reported seeing Atta, whose photograph has been distributed widely through the media since the Sept. 11 attacks. “Whited said no investigators have asked to look at the library's computers. "There were sightings all over," (Portland Police Chief Michael) Chitwood said. "At the library, the Chamber of Commerce. There was a report that they were seen in the City's old port drinking. “On Wednesday, new reports surfaced about another potential terrorist link to Portland. A Saudi pilot, who is on an FBI watch list for people wanted for questioning about possible terrorist ties, told a Moroccan newspaper that he had left a small plane at the Portland jetport. Khaled Alzeedi, owner of an aviation company that operates in Delaware, Saudi Arabia and Morocco, had bought two small planes in Tennessee in the weeks before the Sept. 11 attacks. Alzeedi and three of his assistants later flew one of the planes to Portland. Alzeedi said he dropped the plane at the jetport because he realized it needed a bigger fuel tank. He then left the country and said he planned to return, but could not because of the terrorist attacks. The FBI says that Alzeedi, who is now in Morocco, is not believed to have any connection to the attacks. Yet, the FBI refuses to say why they want to speak with Alzeedi or why his plane is under surveillance at Northeast Airmotive Co., Portland's general aviation contractor. Portland Police Chief Michael Chitwood says he has a lot of unanswered questions about the plane and the Saudi pilot. He sent two detectives to Northeast Airmotive on Thursday, but employees there said the FBI told them not to talk with anyone about the plane. "The FBI is saying there's no connection with this plane to Atta or Sept. 11, but they're not sharing why they want to talk with the pilot," Chitwood said. "It bothers me. If there's no big deal to this, then why the hell didn't the FBI tell us about this six weeks ago?" Comment: Another strange coincidence. For more info see below: Alzeedi. Comment: But on the same day Atta is also very active in Boston. Is there any proof that Atta flew from Florida to Boston on this day? New York Times 5/10/01 states that Atta and Al Omari flew to Boston but gives no details. Comment: But it’s not clear who actually rented the car. Some accounts say Atta, some say Atta and Al Omari and some are cautious. Comment : But it’s not clear actually if both were inside the Nissan. Comment: Is there any proof that Atta and/or Al Omari not already departed on September 9? Is the detail that they departed on September 10 only based on the next known fact, their arrival at the Comfort Inn? Comment: So only one rented a room. Is there any proof that both stayed at the hotel? Is there any proof that Al Omari wasn’t already in Portland? The hotel is a mile from the airport. Comment: The Independent account is very bizarre and has some mistakes. Nonetheless I inserted this. What are all the USA Todays for? Comment: The second Restaurant is not mentioned by the FBI! “A waitress at Weathervane said two Middle Eastern-looking men – one who resembled Atta - dined at the restaurant that night and asked for the details of how the fish and chicken were cooked. Comment: A group of five. We will meet them again! Remark that only Atta is recognized. Who is the second person? Comment: This is the only time the FBI doesn’t say Atta and Al Omari but “two Middle Eastern males”. “Larry Ponemon of Privacy Council, a Dallas consulting firm, said in an interview in June that one study reportedly done on the 19 airline hijackers involved in the Sept. 11 attacks found a pattern in their orders for pizza. "Most college kids order pizza all the time," Ponemon said. "But most people pay cash for pizza. These guys paid with a credit card. That was an odd thing. That became one of the correlates for doing a profile." Comment: It’s rather difficult to see what kind of national security is at stake if we know if Atta eat “Pizza Hawai” or preferred more the Mexican style? Comment: Atta and Al Omari seem to have been very hungry. But they most likely went to another restaurant, too. Comment: This makes three restaurants in one and a half hour! Comment: But this photo is not released by the FBI on their homepage. Comment : This seems to imply that they demanded twice money at a bank machine within ten minutes. What did they need all this cash for? And why not once simply take the whole amount of money one wishes to have? Comment: Why did the FBI not release the photos of this surveillance tape? And if theses are not Atta and Al Omari then who else (who has strong resemblance to the hijackers) is interested in knifes on 910? “Atta spent 17 minutes in the store. 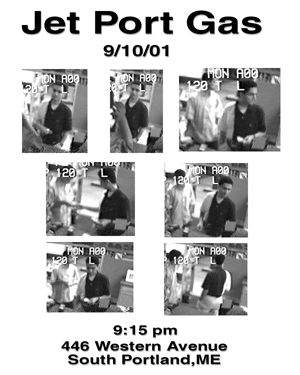 One security picture appears to show him in the store's electronics department. He is seen leaving at 9:39 p.m., carrying a plastic bag with his purchases. The FBI refused to say what Atta bought during one of his final encounters with American capitalism. Comment: Why is it a secret what Atta bought? Why does Atta spend much time in the electronic department? Why is this photo not released? Would it imply what (else) he bought? 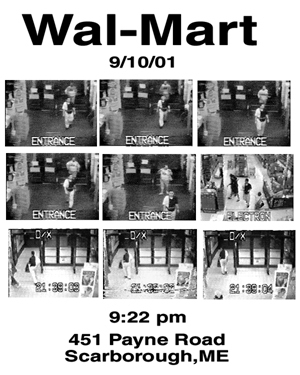 Comment: Most likely this account is simply BS as the security photos show Atta leaving (alone) Wal Mart with his black and white shirt on. Did the “Independent” make up the story about the buying of a T-Shirt as well? “Staff members at the Wal-Mart in South Portland told The Post yesterday that Atta bought the $1.84 boxcutters he used to hijack American Airlines Flight 11 less than 12 hours before he commandeered the plane. He got there just in time. The store closed for the day at 10. The staffers, who asked not to be identified, said they had been warned not to give details. "We all know what he bought," one of them said. "We're just not allowed to talk about it." The staffer was surprised the hijackers had not made their deadly purchase earlier. "It's unbelievable they would leave it to the last minute," the staffer said. Comment: So, to make this clear: The hijackers wait till the very last second before buying the central weapon of their suicide mission and are even so little prepared that they have to ask the way to the Wal-Mart? Why are the workers not allowed to talk at all? Then a bit but their chief remains completely silent? Or is there another possibility? The staffer inventing the boxcutter story because it seemed plausible knowing Atta bought something else? How else to explain that they say what he bought and at the same time telling the journalist Atta bought cutters? Comment: Nobody saw anyone. Too bad although Atta had this eye-catching shirt. Comment: Again: Why this secrecy? Four or five men got out of the car. "They had a tremendous amount of luggage," Lyons said. "About 10 bags." skycap cart to haul their luggage inside the airport. Lyons, who says he lived in Malaysia for nearly eight years, believed that a couple of the men were Egyptian and two others, Iranian. Lyons walked by the men twice as he filled his newspaper racks. "They were talking Arabic and I said 'hi' to them and they looked surprised and then all clammed up. Lyons talked to the FBI three weeks ago about the incident. "They asked me to repeat my story over and over," he said. The FBI had Lyons look at several photographs of Middle Eastern men. He didn't recognize any of the men in the pictures. "I don't think any of the guys I saw was Atta," Lyons said. "I'm more concerned that these guys were support people, who helped the operation out somehow. "It's just too much of a coincidence that this group of businessmen was leaving Portland the morning of the terrorist attacks." “Portland police said they checked his tip and did not think it was connected to the attacks because the behavior varied from the pattern shown by the terrorists. Comment: Another surprising coincidence on 911! There are many accounts of four or five Eastern men that day! Keep in mind the group seen in Weathervine a few days earlier. Comment: Actually it is only assumed that the Nissan went from the Confort Inn to the jetport. It could have come from somewhere else as well. The fact that Atta and supposedly Al Omari checked out and then their Nissan entered the parking lot seven minutes indicates but doesn’t prove that they are in the car as well. Comment : This time is in dispute ! Keep in mind that on the video stills two different times are given! Moreover it seems hard to see how they can manage to park the car till they passed the security in 5 minutes (keep in mind that they had two bags). The photo is actually of no help trying to establish who passed the security check. Comment: The official take off time is of course 6:00 a.m. But still it’s worth pointing out that according to some accounts Atta and Al Omari simply wouldn’t have made their flight if it wouldn’t have been delayed! “Airline ticketing information obtained by the Dayton Daily News shows Atta's name is on the tickets along with a second man, Abdulaziz Alomari. Comment: Take off time is in dispute! Portland Press Herald, 9/15/01 even gives 5:30! At the gate and inside the plane they’re seen by Roger Quirion, his colleague Brian Guerette and Jane Isenberg. Inside the plane also Vincent Meisner witnesses them. So we do know 6 passengers of 8. Quirion and Guerrette are later on Delta 1989 and made an emergency landing in Cleveland. Vincent Meisner was diverted to Chicago. Comment: While there is a contradiction in the accounts of Quirion, Isenberg’s description also differs slightly from the Guerette’s and Quirion’s: Here the hijackers are in a hurry. Moreover Isenberg seems to imply to me that the hijackers would have missed the flight if it would have been in time? This corresponds to the “Financial Times” observation. More Info. See: “Guerrette, Quirion and Meisner”. Comment: If one keeps in mind that Vincent Meisner states to have been seated behind Atta: how is it possible that a machine with 19 seats has nine rows? Comment: Why does nobody talk to the media about his experience of having been seated next to a hijacker? Comment: There is much reason given for the suspicion that actually there is no Colgan commuter flight connecting Portland and Boston. Was this plane out of schedule? Comment: Besides owning a Pontiac, how many cars did Atta rent? Is this a trace to follow in order to figure out if in the last days before 911 there are more than one Atta? 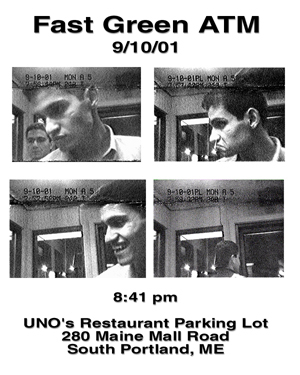 Time unknown: That evening, just hours after the attack, Portland and South Portland police were canvassing area hotels, trying to learn where the men had stayed. “Several employees at Portland area hotels said that FBI agents and local investigators had looked at registration and credit card records Tuesday night and Wednesday morning. Comment: Why “several names”? Why weren’t they only looking for Atta and Al Omari? No sense looking for other hijackers in Portland! Comment: This is maybe not important but somebody who smokes in his car also would take a smoking room, wouldn’t he. But Atta and Al Omari went for a non-smoking room in the Comfort Inn. 5:00 a.m.: “FBI agents swooped down on two houses in Vero Beach, Fla., about 5 a.m. Wednesday, taking a man named Adnan Bukhari into custody, neighbors said. Comment: On September 12 Adnan and Ameer Bukhari are believed to have been suicide hijackers. When Adnan turns out to be still alive while Ameer already dead for one year Adnan is considered an associate in the media and some unspecified evidence that was found in the Nissan linked him/them to the hijackers. 7:30 a.m.: “In North Jersey, a dozen FBI agents and sheriff's officers arrived before 7:30 a.m. in Fort Lee , where they searched Mail Boxes Etc., a private postal storefront in Linwood Plaza on Fletcher Avenue. They left 12 hours later carrying several small boxes; they declined to say what they were looking for. Comment: Anybody an idea why the FBI was there? Morning: “In Bangor, the FBI focused their attention on a cell phone company, where agents interviewed employees at Unicel's corporate office on Union St., next to the Bangor International Airport. Rick O'Connor, senior vice president, said the agents were interested in knowing more about several men who attempted to buy cell phones recently. O'Connor said the company did not sell phones to them. He said he didn't know how the FBI knew about the incident, but agents appeared at the office Wednesday morning. "No one had called them," he said. Comment: The Bangor “connection” seems pretty interesting especially as again there are many eyewitness accounts of people who believe to have seen Atta and others. But without any further explication the case is closed as the case of the terrorists passing the Canadian border. Time unknown: “And in Halifax, the provincial capital, which is 200 miles northeast of Yarmouth, Royal Canadian Mounted Police officers impounded a car at the international airport there, officials said. Comment: I find this rather surprising. They can’t have any photo of Abdulaziz at that moment. Moreover the video is very flue. Especially Al Omari is very hard to recognize on it. I believe the FBI assumed that theses are the two suspects because they recognized Atta and by somehow logical conclusion that the two had left the hotel and parked the car at the airport. But somehow the name creates a problem. Otherwise how explain they disclosed Atta’s name only on September 13 (although his name was already in the press one day earlier - but not in connection with Portland). And Al Omari later. Comment: It was this Mohamed Atta by the way who spend the week-end from September 7 – 9 in New York. Some AP articles of that day still don’t disclose Atta’s identity. So, why if the two name matches does this incertitude remain? “Atta and Marwan rented a Mitsubishi sedan, which they left at Logan Airport in Boston. When the abandoned car was found by the FBI, it contained flight manuals written in Arabic. Comment: Why is this unclear? It is as clear or unclear on September 13 as it is today: the Nissan was rented on September 9 and on September 10 Atta is in Portland. That’s all we know. So, why at that time the uncertainty and why today the certainty what happened, the certainty e.g. that they didn’t pass the Canadian border? “Records show that Atta once had a driver's license in Egypt. Comment: Why then is Atta so active to rent cars? “Mohamed Atta and Abdulatif A. Al-Omari spent the night at the Comfort Inn in South Portland on Monday”. Note already here the two different versions of Al Omari’s name! Had Al Omari a girl friend in Portland? “On Friday, the suspects aboard US Airways Flight 5930 were described as clean-cut and aloof by one of the passengers. "They were very serious. They didn't make eye contact with other people. They were almost attached to the hip, even in the terminal while waiting to board," said Tammy Quirion of Winslow, whose husband was on the plane. Her husband, Roger Quirion, was on the flight with fellow state worker Brian Guerette of Oakland and described the suspects to her. Neither could be reached immediately for comment on Friday because they were driving back from California, where they were stranded. “Among the investigative leads in Portland is one involving a man who claimed to be a member of a hated terrorist organization before he disappeared a month ago. A local woman has told police she was romantically involved with the man, who has not been identified. She said he claimed to be from Turkey, routinely flashed large sums of money despite having no steady job, and kept a gun under his pillow. The woman, who has not been identified, said she met the man at Maine Mall in South Portland, where he briefly worked selling beads. Comment: I would assume that the FBI showed the woman a photo of Al Omari. And if on Friday she was convinced that her love had the body of Al Omari how come then that two days later it’s simply an unknown but very suspicious person? Comment: Apparently Atta rented the car alone. So this implies that there is no way of knowing if Al Omari didn’t already stay in Portland. This seems plausible as he might have had a girl friend and was seen several times in Portland. “"As far as we know, neither man had any connection with this city, or Greater Portland or the state of Maine other than arriving here to catch a flight." Comment: And all the eyewitnesses? And later even the news of Al Omari possibly having an affair with a local women is now only “a rumour”! ”Maine Gov. Angus King said the men were using New Jersey driver's licenses. But Col. Carson Dunbar, head of the New Jersey State Police, said that was not so. The FBI has said it wants to talk to Alzeedi in connection with a matter "totally unrelated" to the hijackings. Alzeedi is a pilot who owns Zidi Aviation, a company with offices in Saudi Arabia and Morocco. In August, he was in Nashville, Tenn. to arrange for the purchase of two Tampico TB-9 airplanes. He told reporters that he flew one of the planes to Portland and left it at Northeast Airmotive Co. to be outfitted with an extra fuel tank. Alzeedi said he planned to bring both planes to Morocco. Mark Goodwin, a spokesman for Northeast, said the plane arrived about a week before the Sept. 11 attacks and that the company routinely outfits small planes going overseas with auxiliary tanks. He said the work is done in accordance with FAA regulations. Goodwin said this was the first time the company had been asked to do work by Alzeedi. He declined to say whether the company had done business with other Middle Eastern companies. On Nov. 7, Portland was in the news once more. In a crackdown on financial networks suspected of funneling money to Osama bin Laden's al-Qaida organization, federal agents raided the offices of two companies with offices in the United States - Al Barakaat, a money-wiring company based in Somalia, and Al Taqwa, a money-management company with offices in Switzerland, Liechtenstein, the Bahamas and Italy. The government targeted offices in Boston, Minneapolis, Seattle and Columbus, Ohio. The government froze the assets of 11 people and groups alleged to have ties to the two companies and arrested a principal of Al Barakaat, Mohamed M. Hussein, who runs the company with his brother, Liban. Court papers say that in March 2000 Liban Hussein opened an account for Al Barakaat at Key Bank in Portland and applied for approval to wire up to $50,000 from Key Bank to the company's account at Emirates Bank International Ltd. in Dubai, United Arab Emirates. According to the court papers, $974,000 was transferred to the bank in UAE between March 17, 2000 and Aug. 1 of this year. The tradition of sending money to family members in Africa and the Middle East is common practice among immigrants. Al Barakaat's executives vehemently have denied that the company has ties to terrorists. "This is all lies," the company's chairman Ahmed Nur Ali Jim'ale said in an interview with the Associated Press. "I was really upset. We have a lot of enemies who would say anything." Citing customer confidentiality, Therese Meyers, a spokeswoman for Key Bank, declined comment on the Al Barakaat account. Why all this contradictions and unanswered questions? Maybe the local police is wondering as well! “And while the FBI will not discuss its activities — even with local police, in many cases”. As shown in "Meet the four unknown hijackers" the FBI was looking in the first days after 911 not for Abdulaziz Al Omari but for Abdul Rahman Al Omari. This already is strange enough but how can it be explained that several witnesses in Portland came up after 911 and said that they had seen Al Omari in the city? We have to assume that the FBI showed a photo of Abdulrahman when looking for witnesses. How can it be explained that people saw Abdul Rahman? He had already left the US before 911. 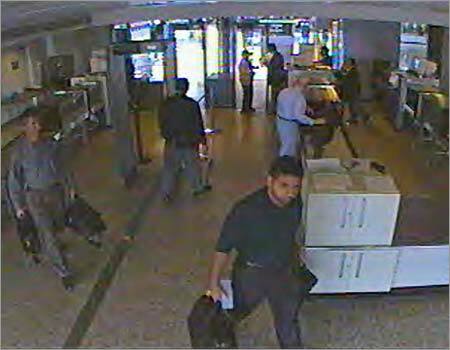 Seven months before he hijacked a U.S. jetliner and flew it into the World Trade Center, Mohamed Atta and two associates tried to get jobs with Lufthansa Airlines that would have granted them access to secure areas of the busy international airport in Frankfurt, Germany, according to a new book. The 33-year-old Egyptian national applied for a job with Lufthansa on Feb. 15, 2001, according to "Netzwerke des Terrors (Networks of Terror)," a book published last month by Juergen Roth, one of Germany's top investigative reporters. By the time he sought work in Frankfurt, Atta had already been to the United States and attended flight training school in Florida. Weeks later he would move out of the apartment he shared with fellow suspected terrorists in Hamburg, Germany. Atta did not know that Lufthansa's personnel division had access to law enforcement files that indicated he had once been under investigation for petty drug crimes and falsifying phone cards while a student at the Technical University at Hamburg-Harburg in 1995, the book reports, citing federal law enforcement sources. Atta didn't get the job. Neither did an Iranian citizen who dropped Atta's name while applying for the job three days later, not realizing an internal decision had already been made rejecting Atta. Nor did a third applicant who showed up on March 5, 2001, with Atta at his side. The three, according to the book, were members of an Islamic study group at the university in Hamburg. One of the two told Lufthansa's personnel division that he had been a pilot in the Pakistani air force, according to the book. Lufthansa's U.S. spokesman Tom Tripp yesterday said he couldn't confirm or deny the report. Best guess about Atta in Portland is that he used it as a switch point, swapping with someone else who took over his identity. Portland is a good choice because it's so close to the Canadian border. One of the Attas could have been over the border before the 9/11 attacks were even done. 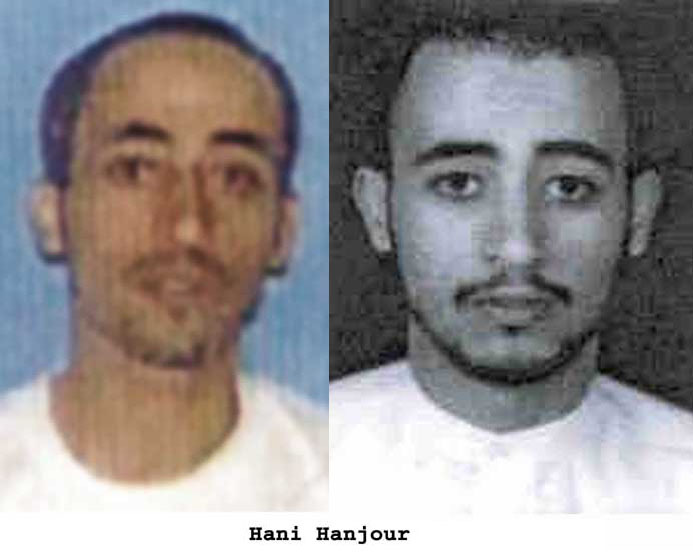 Below are the pictures of Hani Hanjour going through the Washington airport, released by the Associated Press around July 2004. Accounts of him and what can be seen in his head and chest shots shows a man who's thin and wispy. Yet this person going through the airport seems pretty bulky to me. Hanjour is supposed to be the guy at the bottom in the dark shirt. Maybe they're the same person, maybe not.